Everyone knows that there is no cookie cutter for starting a business and that its is no easy venture to enter in. It takes so much effort and requires dedication in order for you to succeed. This fact is especially true in the rental business. Having properties to rent out, such as residential and office spaces, equipment, vehicles, and the like, can be akin to walking on a tightrope because you will then have to make sure that you keep things balanced at all costs. To do it right, you have to make sure that you have a business plan to back you up in every step of the way. 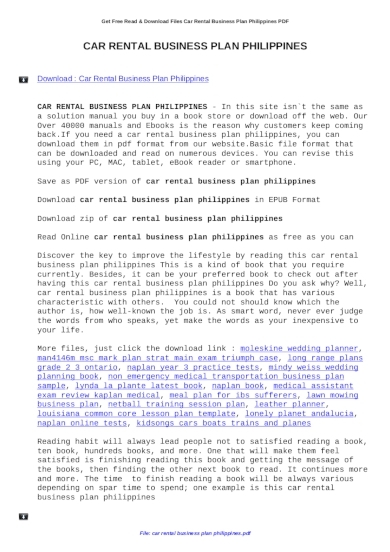 So if you are thinking of starting a rental business, we have provided business plan examples and templates that are specially made for the rental business that you want to venture. If you are about to start a rental business, it is imperative to have a business plan beforehand to make sure that the journey ahead of you will somehow become smooth-sailing. 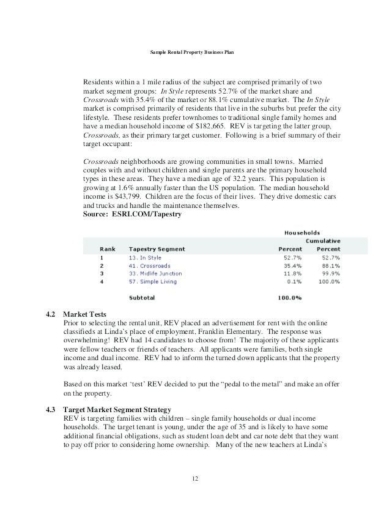 Lucky for you because have already provided a template that allows you to create a rental property business plan that helps you in laying out the systems and the benchmarks that you must implement in order to achieve success in your business endeavors. Running a business might perhaps be one of the best ventures that you will ever enter and that is because of the possibility of gaining a huge profit out from it. One of the businesses that guarantee a huge profit is a property rental business such as an apartment rental business. And before you should ever get into this kind of business, ensure that you have already secured yourself with an apartment rental business plan. Have you always wanted to start a bike rental business but you are simply doubtful because you only own a few bikes to rent out? 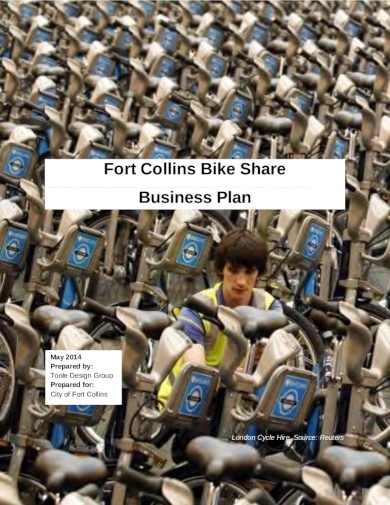 Worry not because all you really need to start with is an effective bike rental business plan. Through a business plan, you will be able to craft out strategies that will enable you to make use of what you currently have as of the moment in order to come up with funds that can help you buy more bikes to rent out and grow your business in general. If you are planning to be in the rental property industry, you must already know and have what you want to rent out. Do you own a good number of good working cars? Why not consider renting these rather than limiting it to your personal or family use or just keeping it idle in your garage? You may make use of the car rental business plan provided above so you’ll be guided on how to carry out this business venture effectively. 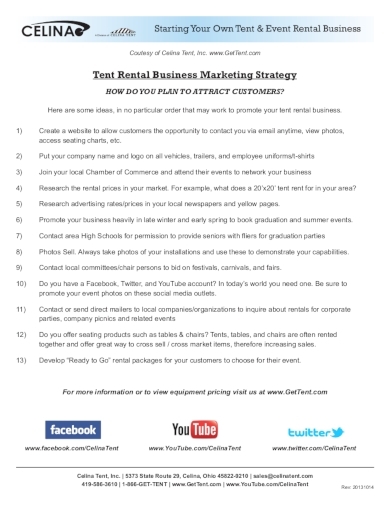 Do you have a brilliant rental business idea in mind? Do not just keep such an idea in your head and materialize it with the use of a business plan. A business plan is important to have if you want to achieve success in this endeavor. 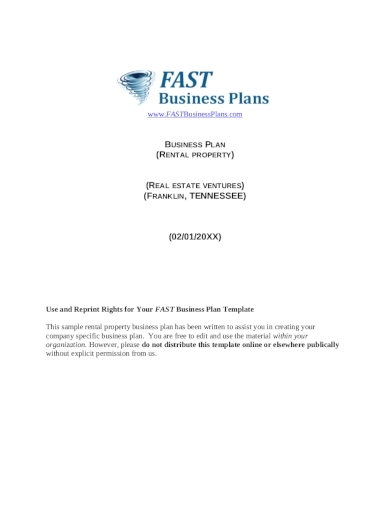 Keep in mind that failing to plan is planning to fail, so if you really don’t want to fail in this kind of venture, ensure the use of a rental business plan such as this sample rental business plan example given above. Having a rental property business is the best way to gain a passive income. But in order for it to become a successful business venture, ensure that you already have a business plan to back you up. Having a rental business plan is a great confidence-booster that will not only help you in mapping out your specific goals and objectives, but it will also enable you to actually achieve it. 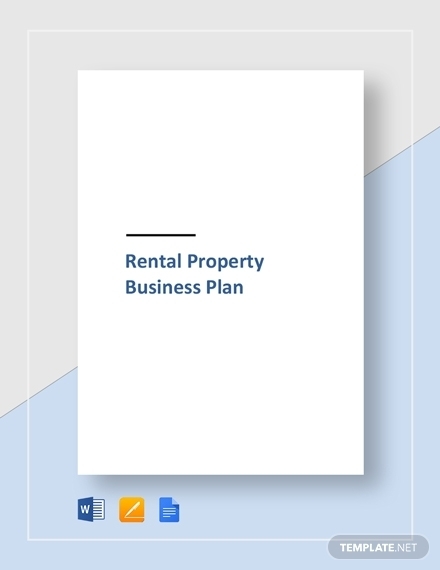 And with that, we provide you with this sample rental property business plan example that can serve as your blueprint for when you will be creating your own rental business plan. No matter how big or small your rental business, it will always be a good idea to have a business plan that can serve as the foundation of your future successful rental business. So even if you are starting out on a small rental business plan and that you have already crafted a business plan, know that this puts you at an advantage against those big and established businesses who never even cared having a business plan. 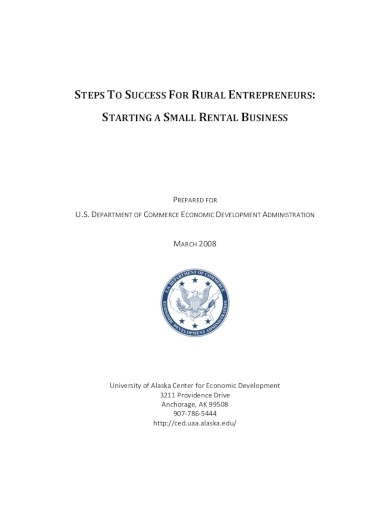 You may consider making use of this ready-made business plan example above to guide you through the process of creating a business plan for small rental business like what you have in mind. Business plans are considered as the most important part of running any kind of business—and that includes a rental business. Through a business plan, you will have the ability to organize your ideas in a comprehensive manner, to present your objectives properly, and to outline the mechanisms that you will be applying upon managing your business-related activities. 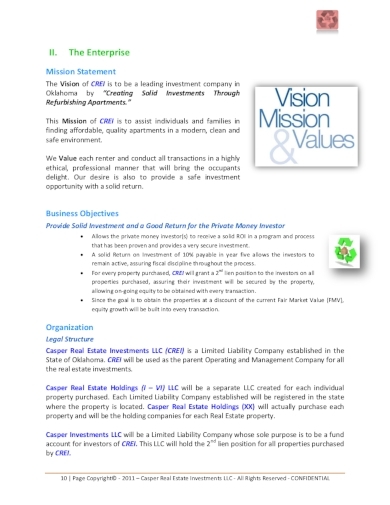 Take a look at the given tent rental business plan example above and see how well a simple idea of running a tent rental business is being presented in a comprehensive manner. Do you own some video games? Why not try making a business out of it instead of letting it go to waste? Having such kind of business is also one way of creating a passive income. 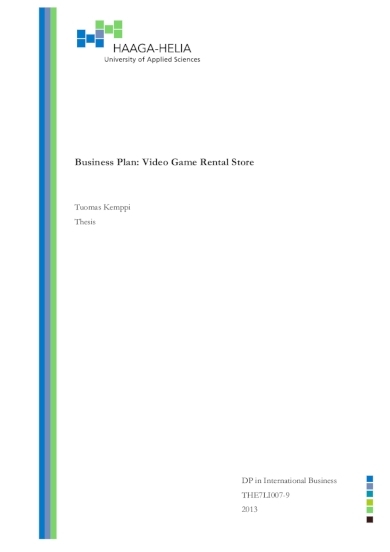 You may make use of the video game rental business plan example above. This business plan will help you in choosing and determining the right market for your business, the possible expenses and sources of funding or financing, and the marketing strategies in general.